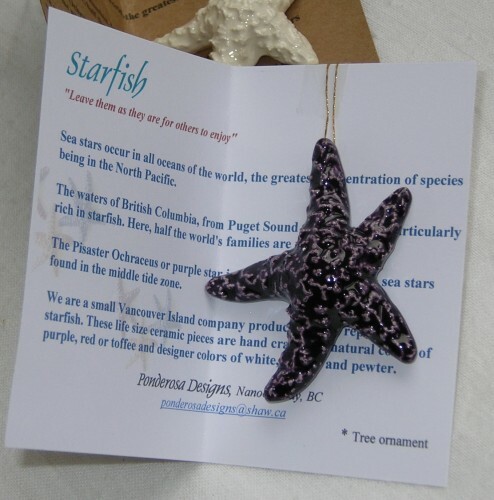 Ponderosa Designs is a small Vancouver Island company producing exact ceramic replicas of starfish since 1994. 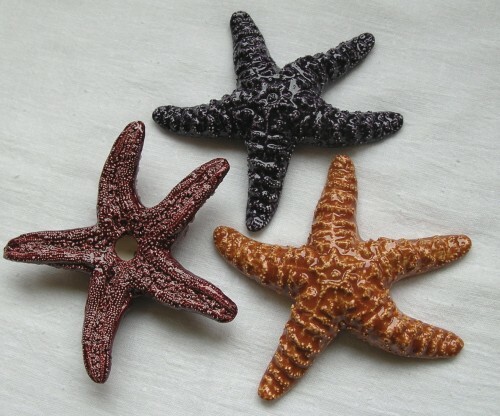 Elaine Bohm produces these delightful keepsakes by creating a mold from an original starfish then uses "production molds" to create these 3 dimensional ceramic pieces. Each is hand glazed and kiln fired in natural and designer colors. Her inspiration comes from beachcombing, kayaking or ventures in their cabin cruiser to quiet coves and nearby islands in the Georgia Strait. Their studio is located in Parksville, BC. We believe in preservation of the marine environment and the company motto is "Leave them where they are for others to enjoy". 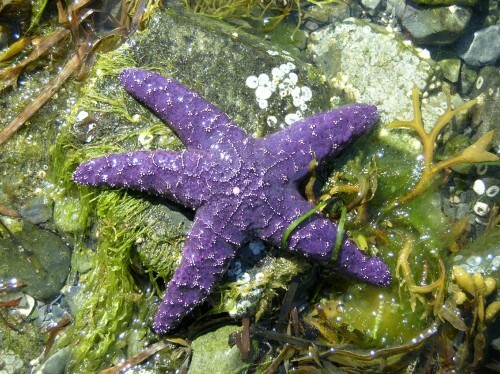 Colors of the purple star vary from black to purple, red, orange and yellow. They have 5 arms and a heavily calcified body which is slow to change shape. They feed on mussels, barnacles, limpetgs and various snails. They can be found in tidal pools or anchored in rock crevices waiting for the incoming tide. This small replica comes with a gold colored clasp & cord for hanging as a ornament. Sea stars are echinoderms, which measn spiny skinned; for most members in the group have defensive spines on the outside of their bodies. As adults, they virtually all dwell on the seabed creeping slowly over it using their tube feet to provide traction. 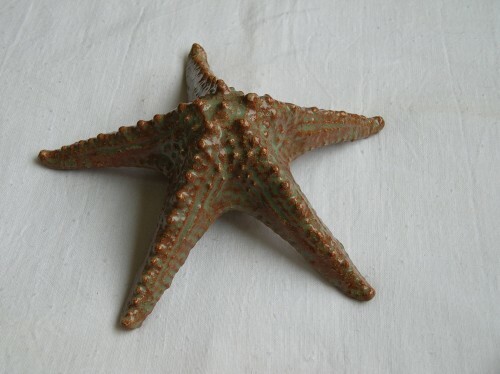 This exact replica of a horned starfish is 22cm x 8cm(9' x 3" and comes in Forest Moss(pictured) or toffee. 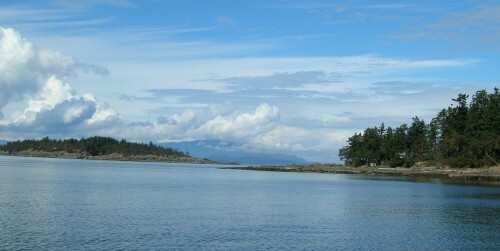 Picture of Beachcomber Park, Nanoose Bay, BC, at high tide, with Mistaken Island of the left.